Looking to take a babymoon or spend time with family before your bundle of joy arrives? Travelling during pregnancy is generally safe, but there are some things expecting mothers should keep in mind before booking a flight. Pregnancy can bring a higher risk of deep-vein thrombosis, a rare condition where blood clots form in the leg and pelvic veins often due to being seated or immobile for long periods. Nonetheless, travelling while pregnant is easy with a little prep. “First and foremost, don’t be afraid to travel. These are some of the last times you will be able to take a truly stress-free trip and it’s important not to fear the experience. The memories of travelling with a baby in your belly will stay in your mind forever and prompt you to give birth to a true traveller,” said Holly Rosen Fink of The Culture Mom. Read our tips to ensure you and your baby stay healthy on the road, and then find your next flight on Cheapflights.ca. General consensus in the medical community suggests it’s best not to travel pregnant before 12 weeks due to morning sickness and the potentially increased risk of miscarriage. Though many pregnant women have no trouble flying in their first trimester, it is always better to err on the safe side and consult with your physician. After 28 weeks, when the risk of going into labor increases, most airlines will require a letter from your doctor stating that you’re fit for air travel while pregnant and confirming your estimated due date. If you’re more than 36 weeks pregnant, many airlines will not let you fly due to the increased risk of delivering on board. “It’s best to travel in your 2nd trimester (between weeks 14 and 28), when risks for pregnancy emergencies – like miscarriage in the 1st trimester or preterm labor in the 3rd trimester – are lowest. Also, after 28 weeks it may be difficult to stay seated for a long time. After weeks 34 and 35, stay close to home so that you are close to your doctor and hospital,” said Hansa Bhargava, MD, a Senior Medical Editor at WebMD.com. A frequent concern among pregnant fliers is the exposure to naturally occurring cosmic radiation during a flight. However, the risks to both the passenger and her fetus are considered negligible, as the radiation exposure of even the longest flight is around 15% of the recommended exposure limit of one millisievert per year. It’s generally advised to avoid travel in the final month of pregnancy as well as during the first 7 days after delivery. Note: Some countries place limitations on the entry of non-national pregnant women. It’s advisable to check with the local consulate to confirm the country specific requirements. Pregnant passengers should be examined by their physician and carry documentation stating the expected date of delivery, doctor’s contact information and blood type while travelling. Some airlines require pregnant passengers to have a medical certificate signed by a physician or midwife. Pregnant passengers should bring a copy of their medical records and ultrasounds and pack them in their carry-on luggage in case they need to go to a hospital or deliver early. Ask your doctor before embarking on any potentially risky activities, such as diving or water sports. If travelling internationally, also check with your doctor to determine what, if any, vaccinations are needed for your journey. It’s one of the 10 things you should do before your trip. For some regions of the world, immunizations are necessary prior to travel. Proof of immunization is a requirement for entering some countries. Some immunizations require more than one shot and some prescriptions like anti-malarial medications may have to be started weeks in advance. Be sure to pack prescription medications in your carry-on. Fill all prescriptions, stock up on common over-the-counter medications, and read up on how to troubleshoot health issues while travelling, which includes advice on what to pack before your trip to be prepared for the most common health issues while travelling, from jet lag and jellyfish stings to sunburn, traveller’s diarrhea and altitude sickness. While most travellers might not think twice about tossing aspirin and routine prescription medications into their bags, travelling with medication should take some thought and pre-planning. Unbeknownst to you, your prescription medicines and even some over-the-counter medications might be illegal where you are headed. From how to pack your medication to what to do if you run out of medication while abroad, read our tips for travelling with medication. Travel with at least 1 companion who also has your emergency contact information. Before take off, make sure your doctor’s number is programmed into his or her phone. “While I generally love direct flights, if you are flying long distance, 2 shorter flights may be better. That way, you can get out, stretch, eat a nice meal and recharge,” said Jodi Grundig of blog Mom’s Favorite Stuff. Each airline has its own rules for flying while pregnant. If you’re booking your flights with an agent, let them know that you’re pregnant when you book your flight and ask they check you are permitted to fly. If booking your flights online, be sure to check the airline’s website. It’s also worth calling ahead to alert the airline about your pregnancy, too. Not only can you confirm that you will be able to fly, but you can also ensure that you get special service to keep you comfortable during your travels. It’s also recommended that you avoid smaller planes that fly below 7,000 feet and choose larger planes with pressurized cabins. 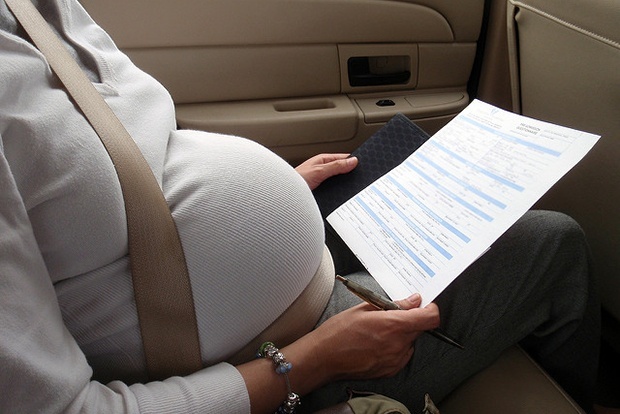 Keep in mind that ticket change fees and penalties cannot be waived for pregnancy. If you’re travelling after your 8th month, it’s a good idea to check with your doctor to be sure travel is not restricted. You might already have some insurance coverage and just don’t know about it. Check with your health insurance provider, credit card company or auto club and see what’s covered during travel. Some travel insurance plans include overseas medical coverage; some just cover personal property and transportation expenses. Be sure to check with your current medical insurance provider to see what’s covered out of state and overseas. Travellers can also buy supplementary travel insurance that provides benefits like emergency medical evacuation. To ensure peace of mind on flights while pregnant, look into air travel insurance in case your trip is canceled or cut short due to your pregnancy. It’s also good to check your medical insurance to see if you are covered in case you have to deliver while travelling. Check if the medical facilities at your destination are adequate to address any medical issues that may arise. Keep a list of local hospitals from the embassy or tourist board. Learn the contact information for the nearest Canadian embassy or consulate, available on the Government of Canada information page. Pack a list of emergency and essential travel numbers to take with you: credit card companies, your doctor’s office, the U.S. embassy in the country you’re visiting; and airline/hotel/car rental phone numbers. Provide this information to your family and friends in case of an emergency, and carry emergency contact information for your family with you when you travel. Be sure to also pencil this information in the emergency contact information section of your passport. Pack everything in your carry-on that you would need to survive if you lost your luggage, including your passport, ID, wallet, all tickets, travel documents, medications (prescription and over the counter), cellphone and laptop. Consider also packing a change of clothes, gadget charger and/or converter and a snack. Don’t over pack your carry-on since you shouldn’t be lifting or carrying heavy items during pregnancy. Check out the amenities your airline offers for free. Wear layered, loose, and comfortable clothing. Since feet may swell inflight, wear compression socks to promote blood circulation. “Bring a small lumbar pillow for comfort. Travel times vary and the worst experience would be getting delayed and being very uncomfortable. That can cause a lot of stress,” said Tonia Sanders of The Chatty Momma. “Carry snacks with you – things like granola bars and snack mix generally travel well. While the airlines may have some food available for purchase, there is no guarantee it’ll be healthy,” said Grundig. Pack nausea fighters. “You may be more sensitive to the motion of the plane, as many pregnant women are more sensitive to just about everything. To prevent nausea, try wearing Sea-Bands, which are wristbands with a plastic bead that puts pressure on your P6 acupuncture pressure point. You can put these on after you feel ill too,” said Liz Borod Wright of Travelogged. Arrive early to go through security. The Canadian Air Transport Security Authority says it’s safe for all travellers, including pregnant passengers, to go through the agency’s Advanced Imaging Technology and metal detector systems as they do not use x-rays but non-ionizing electromagnetic waves to produce an image. Passengers can still opt out and will instead be subject to a pat down and additional screening. Allow extra time for getting through security, particularly if you plan to opt out of going through the screening technology. Pack light as heavy lifting should be avoided during pregnancy. Consider checking your bag or asking a security agent to help you put your bag on the conveyor belt. When boarding the plane, ask a flight attendant to help put your luggage in the overhead bin. Reserve an aisle seat, so it’s easy to get up, move around and use the restroom without having to climb over your seatmates. 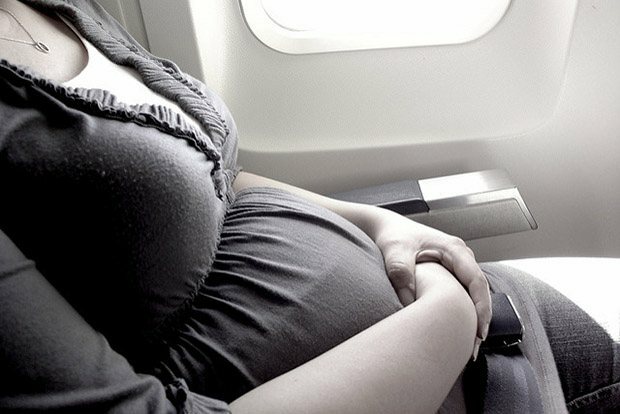 Some airlines will not permit pregnant passengers to sit in emergency exit rows. Pregnant passengers may want to consider upgrading their seat for more legroom. If you can’t reserve ahead, arrive at the airport early and ask for a bulkhead seat. The bulkhead is the partition between business class and economy, for example, which often offers more room. Finally, don’t be shy. When booking or checking in, explain that you’re pregnant and ask if there is any possibility of being upgraded or having a seat with a couple of open seats next to you. Walk around and stretch during the flight. Keep your feet on the floor and avoid crossing your legs or feet. “Pregnant women can be susceptible to colds. By having the vent at their seat directing air down directly in front of them, it can keep fresh air circulating away from them and hopefully decrease exposure to all the viruses their fellow travelling companions may have brought with them” said Janette Strathy, MD. Stay hydrated by drinking water before, during and after the flight. Avoid carbonated beverages. Avoid overeating at mealtimes and overly salty foods. Pack vitamin-rich fresh fruit to snack on during your flight. Grapes, plums, oranges and dried apricots are travel-friendly options. Wear your seat belt continuously to minimize risk of injury from unpredictable turbulence. Attach your seat belt below the abdomen, low on the pelvis. Skin is more sensitive during pregnancy and UV rays are more powerful at higher altitudes, so wear stronger sunscreen than usual. Relax and enjoy yourself on what could be your last diaper-free break for a while. Of course, travelling with your new baby can be a whole new adventure. Check out our travel tips for new parents. The following guidelines are for women who have a normal pregnancy and no previous history of premature labor. Alaska Airlines No restrictions on flying; no medical certification required. Air Canada | Air Canada Rouge | Air Canada Express Travel permitted up to and including the 36th week. Air France Medical clearance is not required, but advised. The airline advises pregnant passengers should avoid flying in the final month of pregnancy. Allegiant Air If pregnant passenger’s due date is within 45 days of travel, the airline requires a note from a physician. All Nippon Airways A medical information form is required if travelling within 28 days of the expected due date; within 14 days of the expected due date must be accompanied by a physician. The certificate must be obtained within 7 days of the departure date. American Airlines Travel is not permitted for 7 days before the delivery date on domestic flights under 5 hours. Travel is not permitted for 30 days before delivery date on international flights or flights over water unless special approval from a physician and the airline’s special assistance coordinator is received. British Airways In addition to pregnancy medical records, a medical letter or certificate from doctor or midwife confirming delivery date and no complications is required for travellers who are beyond 28 weeks pregnant. Travel is allowed up to the 36th week for single pregnancies and 32 weeks for multiples. Cathay Pacific Medical clearance is required for passengers beyond the 28th week of pregnancy; passengers may not fly past the 36th week for single pregnancies and 32 weeks for multiples. Passengers with complicated pregnancies must complete the airline’s MEDA form and submit it no later than 48 hours prior to planned departure. Delta Air Lines No restrictions on flying; no medical certification required. Emirates A medical certificate attesting to a healthy pregnancy is required for those who have entered the 29th week of pregnancy. Travel after the 36th week for single uncomplicated pregnancies and 32 weeks for multiples uncomplicated pregnancy is only allowed after prior clearance from Emirates Medical Services. Hawaiian Airlines Pregnant passengers with no medical complications can fly as long as it is not within 7 days of the due date. Pregnant passengers who are in poor health or have complications may not be permitted to board. For pregnant passengers who wish to fly within 7 days of the due dates within Hawaii need a medical certificate. Pregnant passengers travelling between Hawaii and North America or internationally within 30 days of their due dates need to be examined by an obstetrician within 48 hours of departure. Japan Airlines In addition to pregnancy medical records, a medical letter or certificate from doctor or midwife confirming delivery date and no complications is required for travellers who are beyond 28 weeks pregnant. Travel is allowed up to the 36th week for single pregnancies and 32 weeks for multiples. JetBlue Airways Passengers with expected delivery dates within seven days of travel are prohibited from flying unless passengers have a doctor’s certificate dated no more than 72 hours prior to departure stating the doctor has examined the patient and found the passenger fit to fly. Lufthansa Passengers can fly until the 36th week for single pregnancies and until the 28th week for multiples. The airline recommends a medical certificate for passengers beyond the 28th week of the pregnancies. Qantas Pregnant fliers need a medical certificate or letter from a physician or midwife after the 28th week and at any point for complicated pregnancies. For flights less than 4 hours, can travel up until the 40th week for single pregnancies and the 36th week for multiples. For flights longer than 4 hours, can travel until the end of the 36th week for single pregnancies and end of the 32nd week for multiples. Singapore Airlines Health certificates are required for fliers between the 29th and 36th weeks of pregnancy for uncomplicated single pregnancies and 29th and 32nd weeks for uncomplicated multiple pregnancies. Travel beyond the 36th week for single pregnancies and beyond the 32nd week for multiples is not permitted. Southwest Airlines Recommends against air travel beginning at the 38th week of pregnancy. Spirit Airlines Pregnant passengers in their 8th month of pregnancy are advised to be examined by a physician to ensure it is safe to travel. United Airlines A medical certificate and 2 copies are required for passengers at or after 36 weeks of pregnancy. The letter must be dated within 72 hours prior to flight departure. Virgin America After the 28th week, a doctor’s permission is required. Passengers can travel up to the end of the 36th week for single pregnancies and up to the end of the 32nd week for multiples. Passengers with complicated pregnancies should contact the airline’s Special Assistance team. Passengers wishing to fly after the cutoff dates can only do so for urgent medical or compassionate reasons if approved by the airline’s medical advisors; if approved, a medical attendant must accompany the passenger. Previous ArticleLos Angeles or New York City?